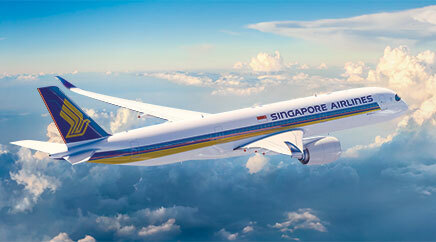 SIA Group airlines’ passenger load factor (PLF) improved 4.6 percentage points to 82.7%. Passenger carriage (measured in revenue passenger kilometres) increased 8.6% compared to last year, outpacing capacity (measured in available seat kilometres) expansion of 2.7%. Singapore Airlines’ passenger carriage increased 5.4% compared to the previous year, against a capacity contraction of 0.9%. PLF improved 4.9 percentage points to 82.7% due to higher passenger carriage registered for all regions, in particular on the Kangaroo routes. The restructuring in the Americas network, and the increase in passenger volume across all routes in West Asia and Africa, also led to higher PLFs in the respective regions. The competitive landscape remains challenging and promotional efforts will continue in relevant markets. SilkAir’s system-wide passenger carriage grew 23.9% year-on-year, surpassing capacity growth of 14.3%. Consequently, PLF improved by 5.7 percentage points to 73.8%. Strong growth in demand exceeded capacity injections across East and West Asia. Budget Aviation Holdings (BAH) recorded a 17.8% year-on-year increase in system-wide passenger carriage, exceeding capacity expansion of 14.7%. Consequently, PLF improved by 2.3 percentage points to 85.8%. Demand on routes to Thailand, India and Australia, as well as fifth freedom routes to North Asia, continued to improve. During the month, BAH launched its maiden European long-haul service to Athens. Overall cargo load factor (CLF) was 4.5 percentage points higher with growth in cargo traffic (measured in freight- tonne-kilometres) of 7.2% against the capacity reduction of 0.2%. CLF improved across all regions as demand outpaced capacity changes.